The vertebrate Tap protein is a member of the NXF family of shuttling transport receptors for the nuclear export of mRNA. Its most C-terminal domain is important for binding to FG repeat-containing nuclear pore proteins (FG-nucleoporins) and is sufficient to mediate shuttling. 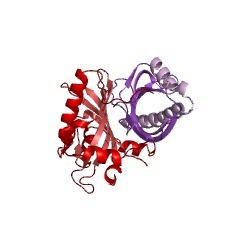 This domain forms a compact four-helix fold related to that of a UBA domain. The vertebrate Tap protein is a member of the NXF family of shuttling transport receptors for nuclear export of mRNA. Tap has a modular structure, and its most C-terminal domain is important for binding to FG repeat-containing nuclear pore proteins (FG-nucleoporins) and is sufficient to mediate nuclear shuttling [(PUBMED:11875519)]. 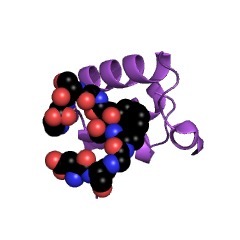 The structure of the C-terminal domain is composed of four helices [(PUBMED:11875519)]. 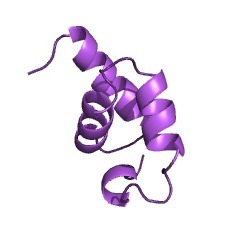 The structure is related to the UBA domain. The NXF family of mRNA nuclear export factors includes vertebrate NXF1 (also called tip-associated protein or mRNA export factor TAP), NXF2 (also called cancer/testis antigen CT39 or TAP-like protein TAPL-2), Caenorhabditis elegans NXF1 (ceNXF1), Saccharomyces cerevisiae mRNA nuclear export factor Mex67p and similar proteins. NXF proteins can stimulate nuclear export of mRNAs and facilitate the export of unspliced viral mRNA containing the constitutive transport element. An NXF protein is multi-domain with a nuclear localization sequence (NLS), a non-canonical mRNA-binding domain, and four leucine-rich repeats (LLR) at the N-terminal region. 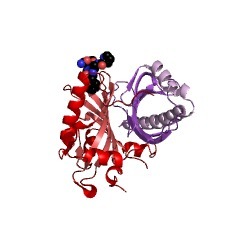 Its C-terminal part contains a NTF2-like domain and a ubiquitin-associated (UBA)-like domain, joined by flexible Pro-rich linker. Caenorhabditis elegans NXF1 are essential for the nuclear export of poly(A)+mRNA. In budding yeast, Mex67p binds mRNAs through its adaptor Yra1/REF. It also interacts directly with Nab2, an essential shuttling mRNA-binding protein required for export. Moreover, Mex67p associates with both nuclear pore protein (nucleoporin) FG repeats and Hpr1, a component of the TREX/THO complex linking transcription and export [(PUBMED:11875519), (PUBMED:20810649), (PUBMED:10567585), (PUBMED:11073998), (PUBMED:11583626), (PUBMED:12581645), (PUBMED:19401465), (PUBMED:11060011), (PUBMED:11256625), (PUBMED:10668806), (PUBMED:11259411), (PUBMED:9660949), (PUBMED:9175835), (PUBMED:10454577), (PUBMED:10323864), (PUBMED:10202158)]. There are 1825 TAP_C domains in 1815 proteins in SMART's nrdb database. Taxonomic distribution of proteins containing TAP_C domain. This tree includes only several representative species. The complete taxonomic breakdown of all proteins with TAP_C domain is also avaliable. Click on the protein counts, or double click on taxonomic names to display all proteins containing TAP_C domain in the selected taxonomic class. 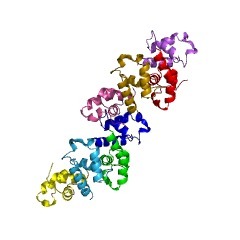 Structure of the C-terminal FG-nucleoporin binding domain of Tap/NXF1. The vertebrate Tap protein is a member of the NXF family of shuttling transport receptors for nuclear export of mRNA. Tap has a modular structure, and its most C-terminal domain is important for binding to FG repeat-containing nuclear pore proteins (FG-nucleoporins) and is sufficient to mediate nuclear shuttling. 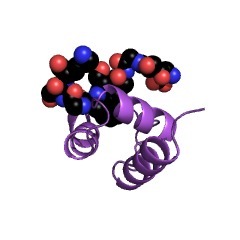 We report the solution structure of this C-terminal domain, which is based on a distinctive arrangement of four alpha-helices and is joined to the next module by a flexible 12-residue Pro-rich linker. F617A Tap suppresses FG-nucleoporin binding by the most C-terminal domain that, together with the structure of the other modules from which Tap is constructed, provides a structural context for its nuclear shuttling function.